SAP Profit Center is to identify how to extract the data from available data and here we are going to discuss regarding basic settings.IDES Corporate has legal entities in Germany, Italy and the United States and requires P &L and balance sheet item reporting across the corporation in various currencies.Carrie Cash, the accountant on your project team, asks you to explain what entity is represented by a profit center. She also wonders about the options available for grouping cost center together for reporting.Carrie also wonders what needs to be set up in Profit Center accounting as far as account numbers for both P&L and balance sheet accounts are concerned.Randy Sales wants to get an understanding where the system will find the profit center for revenue related postings.Your production managers are interested in tracking production variances, as well as inventory values for each of their profit centers. 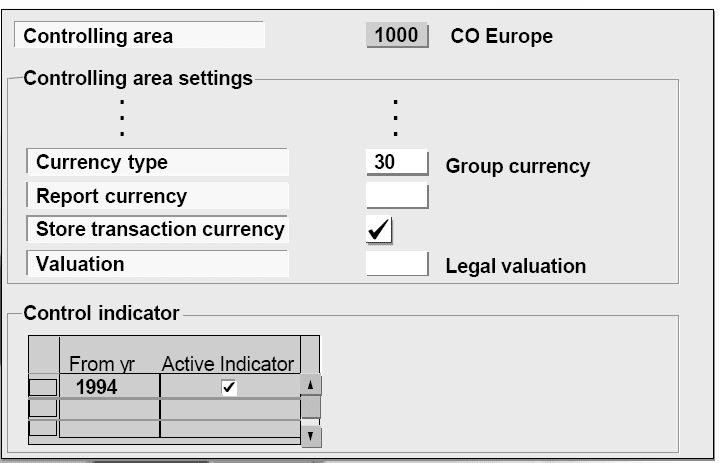 In the currency type field, you select whether to use the controlling area currency (20), the group currency (30), or a special profit center currency (90) as the EC-PCA report currency. 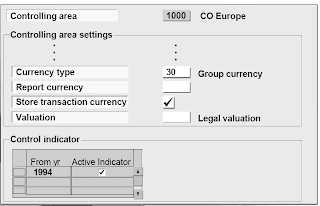 If you choose the last option, you must define the special profit center currency in the report currency field. Otherwise, the second field remains blank. The system will automatically record transaction data in Profit Center Accounting in both the currency of the company code (local currency) and the EC-PCA report currency. If you also want to store the data in the transaction currency, check the store transaction currency box. With the legal view, you can value transactions using the same method used in the legally independent units (company codes). With the group view, you can value goods movements within affiliated companies using a group cost of goods manufactured. The receiver profit center receives a semi-finished product at cost. In this approach, profit centers do not earn profits for internal transactions. To track internal prof its in EC-PCA, you select the profit center view. Transfer prices are automatically selected for goods movements between profit centers and shown as internal revenue and internal costs in EC-PCA. In this case, a goods withdrawal crossing profit centers is shown as a sale in EC-PCA, while it is a consumption posting from the company code view. The control indicator flag activates Profit Center Accounting in the controlling area beginning with the specified fiscal year. If the indicator is not set, no data will be posted to EC-PCA. “Mixed forms” of these structures are also possible. You can, for example, opt for a regional structure based on business locations and then subdivide each location by the products made there.To define this organizational structure, you create profit center master records at the lowest level at which you want to measure profitability. You create profit center groups , including the standard hierarchy, to summarize profitability information at higher levels. For example, for a geographical division of profits, you might establish individual locations (plants, sales offices, and corporate offices) as profit centers. You would use profit center groups to define your regions (summarizing a group of profit centers) and country (summarizing a group of regions). You must define a hierarchical profit center structure before you create profit centers. This structure is called the standard hierarchy. The standard hierarchy is a tree structure for grouping all profit centers which belong to a controlling area. You must assign each profit center to a group (node) of the standard hierarchy when you create it. This ensures that all the profit centers of the controlling area are contained in this structure.You can maintain the standard hierarchy in Customizing or from the application menu. Customizing also provides a function to create profit center groups by copying cost center groups. If your cost center structure is similar to your profit center structure, you can use this function to copy the cost center standard hierarchy to create your profit center standard hierarchy. A profit center is assigned to a controlling area. When creating a profit center, you enter the name of the profit center and the period of validity. Profit center master data is time-based; therefore, you can create different data for different periods of time.You can copy the master data information from an existing profit center.You maintain the important master data on the basic screen, such as the profit center name and description, the person in charge, and the department. The Profit center group field defines the assignment to the standard hierarchy.By selecting the lock indicator, you can lock the profit center against any postings, for the specified time interval. 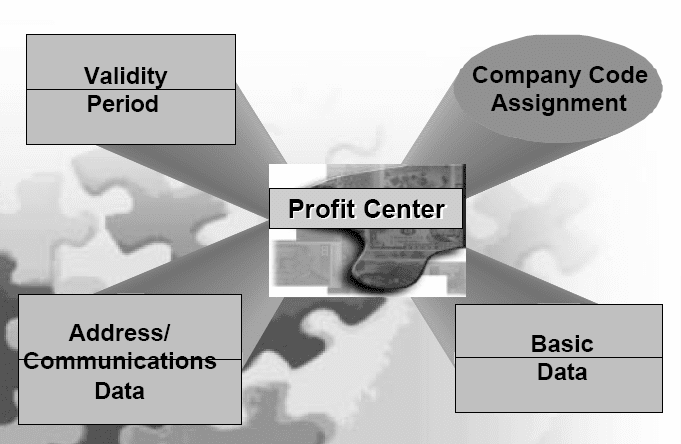 If an object is assigned to a locked profit center and you attempt to post to it, the system will display an error message and does not post the data.You can enter more information for the profit center on additional screens, such as address and communication data and long text about your profit center. By default, a profit center is assigned to all company codes assigned to the controlling area. You can deselect certain company codes for a profit center by choosing Company codes. This setting is also used by functions in Consolidation (EC-CS) in order to create consolidation units.If your profit center and cost center structures are the same, you can copy cost center master records to create new profit centers and then modify them as required. To accomplish this, you must have created nodes on the profit center standard hierarchy which are identical to the nodes on the cost center standard hierarchy. You cannot use this function to overwrite existing profit centers. In practice you may inadvertently forget to assign a particular object to a profit center. 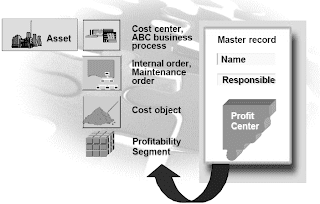 If costs or sales are posted to this object, the corresponding data is posted to the dummy profit center in Profit Center Accounting. This ensures that reconciliation between EC-PCA and Financial Accounting is still possible in such instances. You can also discover missing assignments by analyzing the postings to the dummy profit center. You do not specify a validity period. It is automatically valid for the maximum validity period. You cannot copy the dummy profit center from an existing profit center. A switch identifying it as the dummy profit center is automatically set. You change and display the dummy profit center using the normal maintenance transactions for profit centers. 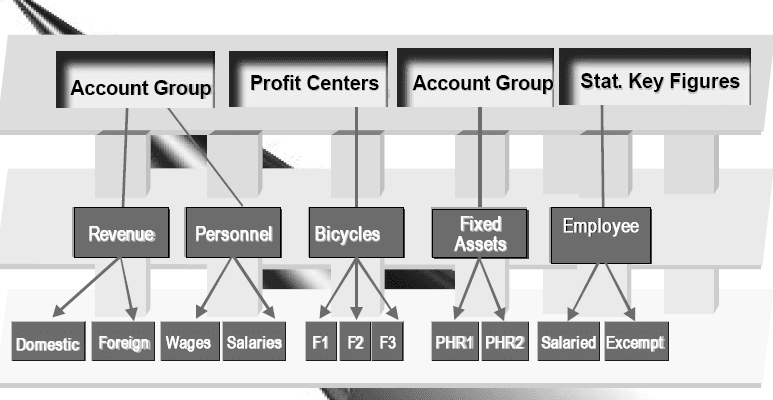 A profit center group is an alternative hierarchy to the standard hierarchy. These are useful in the information system, for allocations, and for planning. 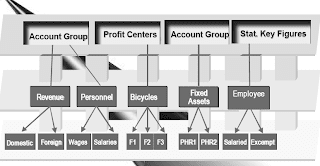 In addition to the standard hierarchy for your controlling area, you can also create alternative profit center hierarchies -- so-called "profit center groups" -- for use in the information system, allocations and planning. In contrast to the standard hierarchy, these profit center groups do not have to contain all the profit centers in the controlling area. On the contrary, profit center groups let you select only certain profit centers and reorganize them to allow you more flexibility. 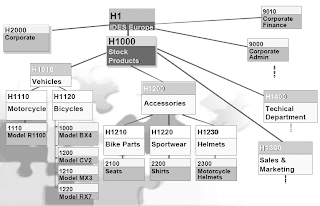 You can define any number of hierarchical structures of accounts for use in the information system, allocations and planning. These structures are called "account groups ". You can create new account groups as well as display or change existing ones. You can maintain revenue and cost elements directly in Profit Center Accounting.As with profit centers, you can define any number of hierarchical structures of accounts for use in the information system, allocations, and planning. These structures, called account groups, are maintained in the same way as profit center groups. Unlike profit centers, however, a standard hierarchy of accounts is not required.Account groups are valid only in Profit Center Accounting. If you want to use the same balance sheet account groups used in Financial Accounting, you can copy these groups into Profit Center Accounting. By assigning all the objects which incur costs or revenues in your system to profit centers, you determine how your company is to be divided into profit centers. These assignments also make it possible to display selected balance sheet items. All relevant account assignment objects are assigned to the respective profit centers using Customizing functions.These assignments mean that it is not necessary to post data explicitly to profit centers each time. Instead, it is posted automatically in Profit Center Accounting when it is posted to the original object. Generally, revenue and goods input are transferred to Profit Center Accounting based on the assignment of sales order items, direct costs based on the assignment of production orders and cost objects, and overhead costs based on the assignment of the account assignment objects in Overhead Management (cost centers, internal orders, and so on). You assign Overhead Cost Controlling objects (cost centers, internal orders, projects, business processes) to profit centers in order to observe the flow of overhead costs from Financial Accounting and their allocation through internal accounting from a profit center point of view. When you assign a controlling object to a profit center, the system makes sure that the controlling area is the same for the object and the profit center. 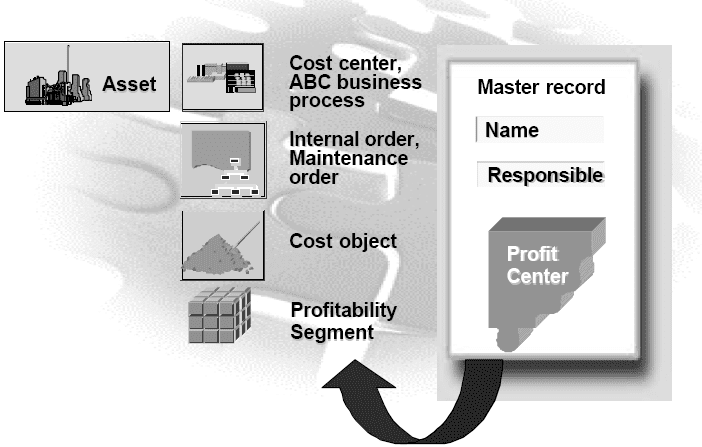 Cost centers and Activity-Based Costing (ABC) business processes are assigned to a profit center in the master record Basic Data.The validity period of the profit center must completely contain that of the cost center or business process. Additionally, the assignment of a cost center or internal order to a profit center implicitly also assigns all assets assigned to this cost center or internal order to the profit center as well.You link internal orders to a profit center in the order master data Assignments. Maintenance orders of the module Plant Maintenance are assigned to a profit center the same way as internal orders. Cost objects are used in Product Cost Accounting to collect and store costs which cannot be assigned to objects on a lower level (orders, projects or cost centers). However, in certain circumstances, you may need to assign a cost object to a profit center. This assignment is the same as the profit center to cost center assignment. In contrast to other assignment objects, profitability segments do not have master records. A profitability segment is a combination of characteristics, such as a customer, product, plant, distribution channel, and so on. One of these characteristics is always the profit center.